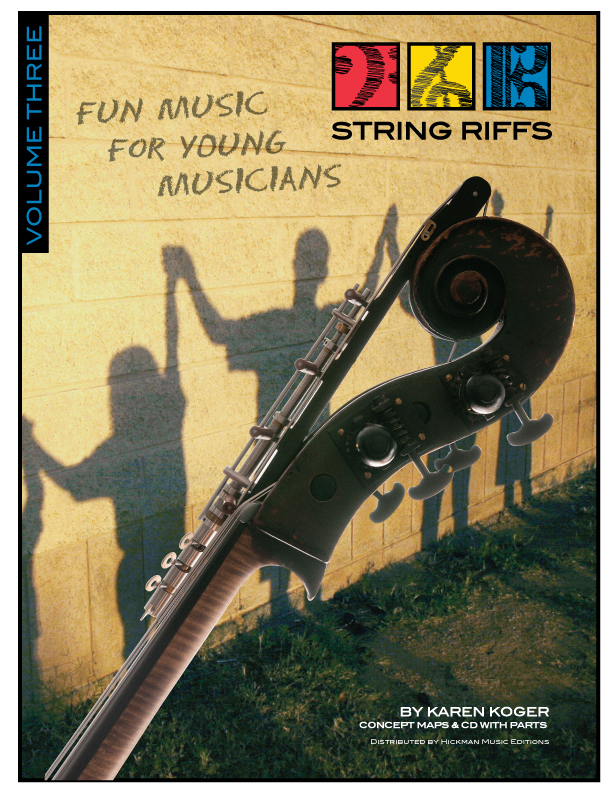 The String Riffs Volume Three teacher’s score reviews earlier skills with slurs, intonation, string crossings, syncopation, key signature changes, tremolo, fermatas, hooked and detaché bows, accents, subdivision, terraced entrances and dynamic contrast. Concept maps help teachers align lesson plans. 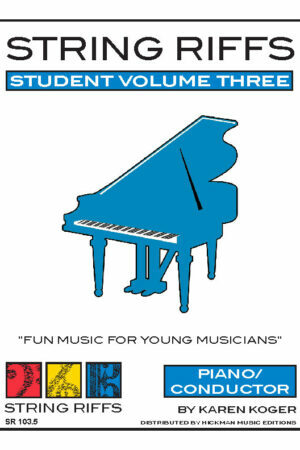 Versatile tunes stand alone or in combination with a complementary higher-level piece (e.g. “The Pirate’s Awakening” with “The Pirate’s Lair”). 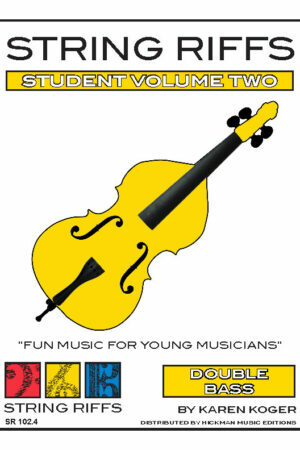 Levels 1 – 2.5 for string orchestra. This volume coordinates perfectly with String Riffs Volume Two – Piano/Conductor, String Riffs Student Volume Two, and the String Riffs Volume Two Accompaniment CD. Keep those feet moving with musical math, 16th-note rhythms, and an intriguing key signature modulation. Chant “cha cha cha” for accented flair and end with a flourish — olé! A “late night snack of tasty rats” is the reward for learning legato, slurs, dynamics, and string crossings with rhythmic lyrics. Syncopation adds a dash of hot sauce to this Southwestern treat topped with hooked and detaché bows, accents, melody for cellos, and two-part composition. Hop through quick slurs, staccato accents, and rhythm changes with stop- and circle-bow practice. Find your inner bunny with subdivision into eighth and quarter notes. Show confidence and keep counting as you step into the arena on playful terraced entrances. Fourth finger agility takes the place of open strings. Stroll up and down the G-string and conquer first-position basics using the patterns of a round. Learn the secrets of memorizing new G-string notes with pizzicato and arco, and encourage eager players with a “challenge” section. Keep up with this fast and feisty desert bird using counterpoint, and sharpen your ears with open harmonies, part independence, and intonation work. Slurred scales require loose hands and a steady beat with dynamics and circle bows. Watch those tiny, spiny balls of fur wander and fiddle across the C major scale and review the G-string with a steady beat and section practice. When the sky turns grey, phrasing across a large musical arc requires extra strength from the violas and second violins. Melody, harmony, slurs, and ties build a rising storm with crescendo and diminuendo. Ride ‘em, cowboy! Cello and bass extensions strengthen bull-riding skills, while left-hand pizzicato requires a steady hand on the reins. Try calf roping in cut time. Sail the high seas with sloshing, swaying patterns in 6/8 and 3/4. Aggressive accents and double down-bows lead to the buried treasure of eighth-note subdivision in a flexible intermediate-to-advanced format. In this companion piece to The Pirate’s Awakening you’ll find the exciting treasure of more challenging parts for your advanced players. Slither, shuffle, and scamper from D minor to D major and back again. Watch for flats and sharps using high/low fingerings, slurs, and terraced entrances. It’s time for a party on the G major scale — break out the hooked bows, half notes, and quarter notes in 3/4 time. Watch the low strings lead the way with a driving line as this colorful beaded lizard encourages the challenge of eighth notes and rests. Extensions and low fingerings work with double up-bows and dynamics for fast fun.